Hi there! My name is Alfred and I'm a Top Writer on Quora.com. As an Arsenal fan, I follow the Premier League closely, though I also watch other teams like Barcelona and Dortmund. To know more about me, you can visit my Quora profile, https://www.quora.com/profile/Alfred-Yip-6. 2018 is the year when Arséne Wenger decided to pave way for his successor at the Emirates. 2018 is the year when Unai Emery proved his doubters wrong by achieving an amazing unbeaten run with his team. While it wasn’t plain sailing in the second half of the year, the first half of 2018 wasn’t pretty either. In this article, we’ll be taking a trip down the memory lane to review 2018 as a year for both the team and the fans. The beginning of the end of the Wenger era. I’m pretty sure that the football world was shocked to hear that Arsenal were knocked out by Nottingham Forest in the FA Cup last season, an embarrassing feat which never happened under Wenger, until 2018. The away days in the final days under Wenger weren’t nice either, losing most of the games away from home with the chance of winning the Carabao Cup slipped away by being beaten by Manchester City 3-0 in the final. There was some good news, though. Wenger’s parting gift to Arsenal, Gabon striker Pierre-Emerick Aubameyang, proved to be a solid signing for the team and now, Emery is unleashing his potential to his best. In Europe, Arsenal reached the semi-finals of the Europa League, where Atlético Madrid progressed to the final thanks to the goal by Diego Costa at the Wanda Metropolitano, which made it 2-1 to the home side. So basically, Arsenal won nothing at the end of 2017/18 season aside from the FA Community Shield. They were 5th in the Premier League and hence, are currently playing in the Europa League again. The end of the beginning of the Emery era. When Unai Emery was presented as the new Arsenal manager, I still could remember that he needed a translating device to his ear in order to understand English. But apparently, he doesn’t need one now. Emery’s first PL games after moving from PSG ended up with two consecutive losses. However, they were reasonable defeats, considering the opponents were Manchester City under Guardiola and Chelsea under Sarri. After beating West Ham 3-1 at home, Arsenal endured a 22-game unbeaten run in all competitions, including the North London derby which was won 4-2 in style, until being beaten by Southampton away 3-2. Their Carabao Cup journey also came to an end as Tottenham gained their revenge from the loss earlier this month with Son Heung-min and Dele Alli knocking the home side out by their goals. Arsenal will be seeking for improvement after winning against Burnley and starting another unbeaten run. At the time of writing, Aubameyang is the top scorer of the Premier League. Hopefully, he’ll score more in 2019! Emery may not be at the same level as the top managers in the Premier League, like Klopp, Guardiola and Pochettino, but for a club who needs to rebuild the team like Arsenal, he’s a reasonable choice. Back then when he was with Valencia and Sevilla, he had the reputation of having the ability to win trophies with a limited budget. This is partly why Arsenal decided to offer him a contract as Kroenke is a Scrooge. Emery happens to be the right man to replace Wenger. As I’ve written before, Emery is the exact opposite of Wenger who doesn’t allow his men to give up and the mentality instilled is amazing, despite it doesn’t always work. A positivity-driven coach, Emery is also active on social media and listens to the opinions of the supporters. He’s a bit stubborn to make changes during half-time but sometimes, it proved to create the game-changing moment later. Note: This list is in no particular order and is subjective with the preference of the author. I’m too lazy to list them out here. Please refer to my answer on Quora for the details. Aubameyang is now proving his worth in the Premier League not only by scoring goals but also giving assists and helping the team in defence for a little bit. What a signing Wenger made before he left us! Despite that he could have done better with the positioning and stuff on the pitch, you can’t really blame him for not keeping clean sheets. One thing for sure, though, is that Leno has the qualities to succeed Čech of his No. 1 shirt. While there’s a huge chance that Arsenal won’t be winning anything these days, it’ll be interesting to see how Emery and his boys will do in 2019. It’s going to be tough, but I believe that they’ll weather the storm eventually. On a side note, on behalf of the team, I would like to announce that FootyFans will be taking a break in predicting Premier League fixtures. We’ll be back in 2019. See you later soon! Hello there, folks! It’s me again. Dan’s AFK at the moment (for a certain reason, of course) and I’m here to deliver our predictions of the Round 18 of the Premier League this season. Onto the tipping! It’s quite painful to become an Arsenal supporter these days. At the time of writing, Arsenal are out of the Carabao Cup and lost their first Premier League game against Southampton, having their unbeaten run ended. Now, impatient fans may ask Unai Emery, our newest manager, to get sacked after just four months of appointment. However, while we may not lift any trophy in his first year, I truly believe that Arsenal shouldn’t fire the Spaniard. Reason 1 – Rome wasn’t built one day. If you follow Liverpool, you should know that Jürgen Klopp spent a few years to modify his team. He made a lot of sacrifices and at last, he achieved his aim and are looking forward to clinching the title this season. Now, I’m not saying that Emery is at the same level as his rival coach. However, I’m thankful that he brought quality signings (like Torreira, Leno and Sokratis) to bolster the squad. Even though it’s not something to be finished in a transfer window or two, all he needs is time and money. And we, as supporters, should have his back instead of turning on him at this crucial moment. Reason 2 – He promotes positivity in the team. I started to dislike comebacks in sports because it showed that they didn’t pay enough attention when they play and started to make mistakes so you’ll need extra effort to win. It’s not a good sign and should be avoided at all costs. Frankly speaking, Arsenal were quite lucky in their previous unbeaten run, where they should have lost a few games already. Alas, the philosophy of “winning ugly” is in Emery’s DNA. And it’s unlikely to be changed. The good thing about Emery is that even though they can’t win the game, he’ll ask the players to fight until the end. Mkhitaryan kept the hopes of Arsenal keeping a draw against the Saints by scoring a brace before Austin crushed it. It wasn’t pretty at all but at least better than giving up and concede a few more. Good improvement nonetheless. Reason 3 – Some matters are out of his control. Sadly, real life is no Dream League Soccer or other football games where you can heal injured players in just one click. As Arsenal are currently hit by injuries, Emery must be having a headache in the selection. They’re yet to be potential title contenders but thankfully, are on the right track of being one of them. Now, they must treat the “wish lists” in the transfer market seriously and wish that there are no new injuries in the future. Reason 4 – He’s currently the best option Arsenal have. I’m a realist and here’s my question, “who are you going to replace Emery with if he’s sacked right now?” Laurent Blanc? 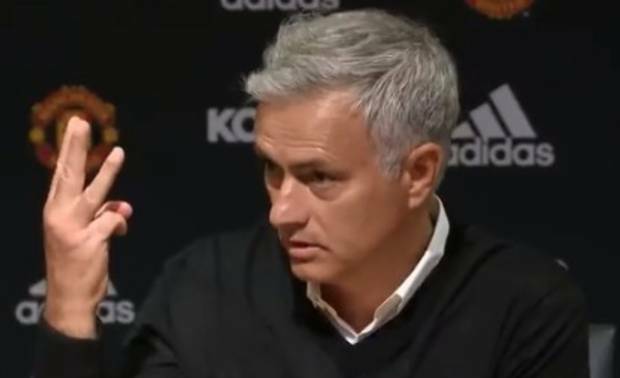 José Mourinho? Or would you consider re-hiring Arsène Wenger? I have to admit that football is an unpredictable sport but you’re not firing someone who led the team to a 22-game unbeaten run when you just lost 2 games in a row (and 4 in total). This is plain stupid. Arsenal are already doing better than Manchester United who still fails to replace Sir Alex Ferguson to date. At least Kroenke didn’t consider David Moyes when he was scanning through the CVs (I wonder what will happen if it’s true). At the same time, only time will tell if Emery is the right one. Right now, he should stay unless things go really bad. Reason 5 – Arsenal needs him for the Europa League. Seriously. Having won the competition three times with Sevilla, we would expect Emery to help the Gunners to lift the trophy in Baku. Yet, as they’re in the knockout stages of the competition, there are too many uncertain factors in it. For Arsenal, reaching the “Top 4” in the Premier League is no longer something reachable. With the Europa League being Emery’s favourite competition and a target more feasible to aim, it’s a “now or never” opportunity for them. Frankly speaking, Emery is one of the reasons why Arsenal are seen as favourites of winning the Europa League this season. Yes, there’s no guarantee that the club will win it, but it’ll certainly be harder without the Spaniard. So why would the club want to release him at the expense of the qualification of the Champions League, which matters them the most? The management isn’t formed by a bunch of stupid people but smart money makers. Yes, I understand that it’s demoralising to lose consecutive games, especially against Tottenham. But don’t lose hope, Gooners. The season isn’t over yet and everything can happen with a lot of fortune involved. Here’s a fun fact for all of us: Wenger didn’t win the title in his first year and the rest is history. Hope Emery will prove his doubters wrong soon! At this stage, just be patient and bear in mind that “nothing worth having comes easy”. What is the first thing which comes to your mind when it comes to Germany? Oktoberfest? Angela Merkel? Or Die Mannschaft‘s disappointing performance in the World Cup this year? For me, it reminds me of how underrated the Bundesliga is. For football fans who truly see the sport as an art, it’s not something they should miss every week. Why? Let’s check it out! Reason 1: It’s not just Bayern and Dortmund. Despite teams like Bayern Munich and Borussia have a higher chance of winning the league (and playing in Europe), there are a number of underrated clubs in the Bundesliga. For example, Eintracht Frankfurt, who are on fire in the Europa League this season under Adi Hütter. Also, Hertha Berlin, Möchengladbach, Hoffenheim, Leverkusen and Nürenberg are also some of the sides worth following. Not to mention the 2. Bundesliga, where Hamburger SV, FC Cologne and Union Berlin are competing. You can watch that too if you’re interested and let’s see who’ll be promoted to the first division in May next season! You may ask, “how about Leipzig?” Well, I personally don’t have hard feelings about them, but I’m not a fan of them either. Just saying. But the truth is, the Bundesliga can be fun to watch even if you’re a fan of the mid-table clubs. Reason 2: Match highlights almost guaranteed. It can be frustrating to know that clubs charge people for watching the matchday clips (especially if you’re outside Europe). Worry not! There are, indeed, highlights from Germany in English from YouTube, just like this one. Sadly, it’s not available everywhere (like New Zealand, as Zac told me before). But when in doubt, YouTube is your friend. Try Fox Sport or the official Bundesliga channel for those moments, especially during the derby days. Reason 3: Bloopers? They get you covered too! How about this one, if I didn’t impress you by the first two? Well, even if the clips didn’t make you smile, you should get what I mean. Bundesliga isn’t just a football league, it reflects a part, if not all, of the culture in Germany. And it, somehow, reminds us that Germans can be humorous too. Reason 4: You get to know the underrated stars. Aside from Alfred Finnbogason, the Icelandic striker who’s playing for FC Augsburg in the “featured image”, there are some names that I would like to mention in this section. Players like Jonathan Tah, Kevin Volland, Sébastien Haller and Luka Jović are the talents to keep an eye on. Not to mention that a number of Germans stars like Mesut Özil, Leroy Sané, Toni Kroos and Bastian Schweinsteiger played in the Bundesliga too! You’ll miss out the chance to spot the future celebrities in football if you don’t follow Bundesliga. Simple as that. Reason 5: It’s more than just a game, after all! It’s quite interesting to know that some of the words in the football vocabularies in German has its own meanings. The word for “penalty kick” in German is “Elfmeter”, meaning “a kick from eleven metres” whereas in the word “gegenpressing”, “gegen” means “against” while the word “pressing” is self-explanatory to English speakers. For me, the Bundesliga isn’t just a thing for entertainment. As a Dortmund lover who’s learning German, football can be a useful tool to aid me in learning the language, especially in both my listening and reading skills. You may hate Bayern Munich for dominating the league and bullying the small teams. You may despise RB Leipzig for being the “Manchester City in Germany”. You may laugh at VfB Stuttgart for their poor performance. There can be many reasons to dislike the Bundesliga. Yet, the thing is, being competitive is in the Germans’ DNA. This is what makes Bundesliga an interesting league to watch and makes it more than a game of 90 minutes. Oh my god! It’s been a few days since the last matchday and here we are again! I’m doing the predictions this round because Dan’s experiencing yet another technical difficulty. Zac is going to fill in his place. So here it is, our predictions of the Round 17 of the 2018/19 Premier League season! By the way, Oliver is taking the lead with 94 points and I’m second with 92 with Dan hits rock bottom like Fulham (72). I follow a lot of football clubs as a lover of “the beautiful game”. And as a social media addict, I also happen to use Instagram to take a look at the latest football news and chat with my fellow football fans. However, if you follow my personal account, you’ll know that I follow no fan pages of my favourite clubs with one exception – a BVB fan page which provides English translations for their posts (I do so to help me to learn German). Unlike one of my friends, who is a Barcelona fan and follows the fan accounts of all kinds, I’ll never pay attention to the fan pages like what I used to do. Or I’d say, I have a critical view towards them. The cause of this mindset? The fan pages can be biased and the news they share to us can be wrong. I’ll use Barcelona as an example for your easier understanding. We know that Barcelona is one of the most decorated clubs in the world and have a long-standing rivalry with Real Madrid. For those who follow football, this shouldn’t be hard to explain, right? I’m not going to generalise the whole situation on Instagram and not going to lie, a few fan pages did really a good job of being neutral in the middle of the friction. But at the same time, I have observed that a number of them are one-sided. It doesn’t matter if they’re Culés or Madridistas, bragging right is what they’re fighting for. What some of the Culés do is that they troll Cristiano Ronaldo and Real Madrid (with a “once in a blue moon” chance, Juventus) all day long. Even if Real are playing well, they always happen to get a reason to do it. In return, some Madridistas do the reverse to Messi and Barcelona, calling them “Uefalona” (which isn’t true nowadays). The lack of respect towards their eternal rivals disgusts me. I’m not saying that they should love their enemies as they love their own club, like what the Bible said (with reference to Matthew 5:44). I also respect their right to speak out on Instagram. However, when I see this kind of stuff, I tend to ignore them or laugh them off. Occasionally, I’ll leave them a “like”. Then I continue to read the other posts. As football fans, we’re entitled to our own beliefs. In this case, you don’t have to be impartial or neutral. Yet, it’ll be better if we read more from different kinds of sources to know about the whole picture of the sport. To be fair, somehow Mourinho is right about the “respect” issue in football. In reality, it is hard for supporters of one club not to be subjective towards their eternal rivals. Despite that, football should forever be a playing field with elements of fair-play, whether it’s on or off the pitch. Speaking of which, as you’ve noticed, we do have our own Instagram account. So why don’t you drop by, take a look at our contents and give them a “like”? A “follow” will be much appreciated! We all love watching men’s football and without a doubt, most of our posts are about 20 men running and fighting for the possession of the ball. However, in recent days, women’s football started to grab my attention and eventually, I became a fan of the women’s team of Arsenal, just like what I did to their men’s counterpart. Of course, I’m not supporting Arsenal just because of Vivianne Miedema (and her smile), my favourite player of the squad. The reasons why I’m a fan of the female Gunners? Here you go! The connection with the men’s team. I love Arsenal as a club. Despite women’s football doesn’t get much attention compared to the men’s counterpart, the Gooners family is quite supportive of their young ladies. The history. As the most-decorated club in English women’s football, they also won the Women’s Champions League in 2006/07 as the first English club to do so. Ironically, the men’s team failed to do the same – sad! The quality of the squad. 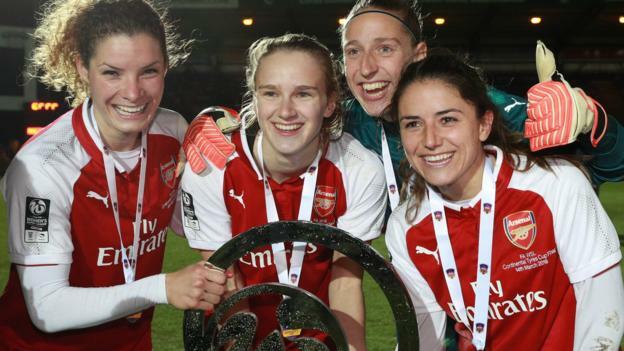 Of course, Arsenal Women aren’t just about Vivianne Miedema, but also other good international players like Jordan Nobbs, Daniëlle van de Donk, Sari van Veenendaal and Lia Wältl. The fighting mentality. The female Gunners aren’t just models off the pitch. They’re warriors when they don their jerseys, doesn’t matter which colour it is. Just like the boys these days who’ll do everything for the points. The style of the football they deliver. Joe Montemurro does a great job in managing the team, who reminded me of Emery of the men’s team – ruthless in making changes and a proven motivator in the dressing room. If you really want to watch regular women’s football, the FA Women’s Super League (FAWSL) can be a good start. Yet, Arsenal aren’t the only side with a decent team. Chelsea, Manchester City and Liverpool are also eager to become the table toppers despite the fact that luck wasn’t on their side. And this is what makes the FAWSL interesting. In fact, women’s football is underrated these days. A number of international clubs like Bayern Munich, Juventus and most recently, Manchester United have their own women’s team, nonetheless, they’re in the shadows of their men’s counterpart. Football should be a sport for everyone, regardless of their gender. Let’s promote women’s football and have them gain the recognition it deserves! Come on you Gunners!